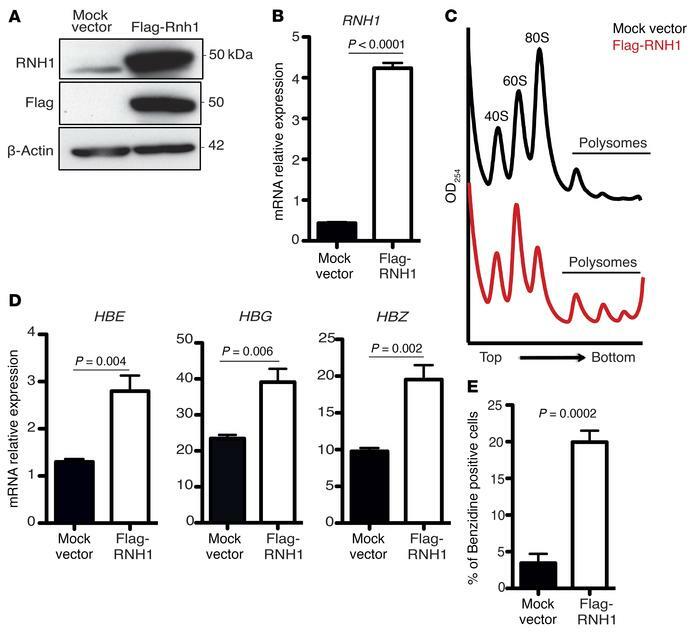 RNH1 induces globin gene expression in K562 ells. (A) RNH1 expression in stable K562 cells expressing mock or Flag-RNH1 vector by Western blot. Blots are representative of 2 to 3 independent experiments. (B) RNH1 expression in stable K562 cells expressing mock or Flag-RNH1 vector by qRT-PCR. Relative mRNA expression was normalized to HPRT expression. Data are shown as mean ± SEM. Data are representative of 3 independent experiments. (C) Sucrose gradient polysome profiles for mock- or RNH1-expressing stable K562 cells. Arrows show direction of the sucrose gradient from less to more dense. Data are representative of 3 independent experiments. (D) qRT-PCR analysis for globin genes in stable K562 cells expressing mock or Flag-RNH1 vector. Data expressed mRNA levels normalized to HPRT expression. Data are shown as mean ± SEM. (E) Percentage of benzidine-positive cells in mock or Flag-RNH1 vector–expressing stable K562 cells. Data are shown as mean ± SEM. Data are representative of 3 independent experiments. P values were determined by 2-tailed t test.